Would you say most of those cracks are about where the huge knot on the back is ? ....or are the cracks a bit higher up ? Most of them pretty much opposite the knot. Might be an influence? Not sure. Those cracks look quite ugly, are you using ghastly match balls? We use the Hunts County balls, as they are the league sponsor. They're ok, tend to lose shine and soften after 10-12 overs. I don't think the balls are to blame tbh, though of course I face them when new and hard. The cracks probably look worse then they are, and you know how i prefer not to use a scuff sheet. Balls yes there hadn't used to be any foriegn made lacquered balls cork wrapped in hand stitched leather which must have been a factor why bats rarely broke also lots of players only had butterfly's. We do get 2 per game now which is more expensive, but better. My bats don't break, but they do crack a bit. I don't mind really, these are tools right, so wear and tear seems acceptable. I also think that a cracked bat is rougher, and better for taking the shine off the ball. Evening all! OK, about time for an update on this, now 2 months into the season. I've had 3 further knocks since last time I wrote - the football, the family and the slightly eccentric fixture list have got in the way of things. But, I've been in decent form, adding 32, 63* and 21 to my previous efforts. I'm happy to report that the bat remains in one piece, and has now seen me through around 128 overs. The fast outfields have flattered my shot value which is great, I guess I've faced about 400 deliveries and have hit about 40 4s. Still facing the new ball, still facing the freshest bowlers. So, all good, and the bat itself has really started to open up. I would recommend it, but it's one-of-a-kind as you know. However, as you can see in the photos below, there is indeed a clear correlation between the lines of cracks across the face, and the lines of storm damage that show across the back. This is interesting, and I am prepared to concede that 'damage-caused-by-wind' is after all, a thing. It seems to me that willow follows Hookes Law, which we all remember from O Level Physics. Storm damage appears when the tree slightly exceeds its elasticity limit, enough to mark the wood, but not so much that the tree snaps or falls over. But! I also strongly believe that this concession does to some extent start to prove my point. In my opinion, storm damage is a symptom of catastrophic bat failure, but is not the cause. 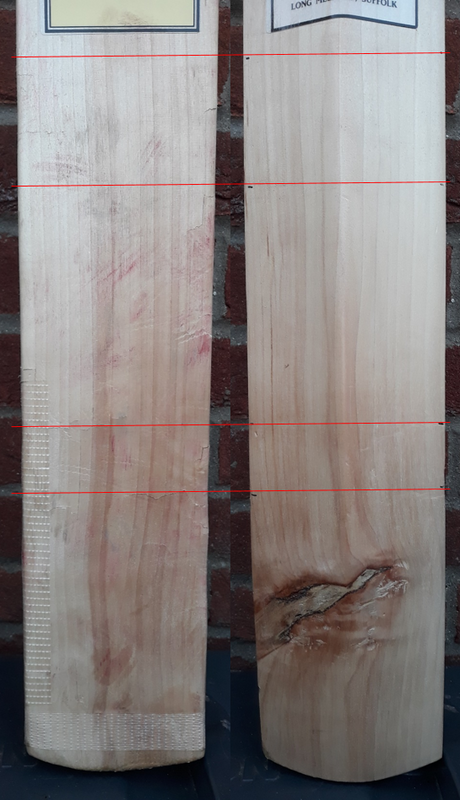 My feeling is that my bat will crack, but not break, because the higher moisture content at cellular level will continue to bind the fibres of the wood together. In cases like the Carberry incident, the timber fractured along the storm damaged line because it was dried too far, not because of the winds the tree was subjected to as it grew. So, feel free to continue the debate. I'll keep playing, and reporting on progress. I’m not sure if the cracking to the blade is linked to the storm damage. I’d be of the opinion that it wasn’t pressed or prepared fully, some pretty decent seam marks showing on it. Hardwood can break and show damage more easily but wouldn’t expect a bat to look like that because of storm damage. Thanks John, that's an interesting comment. It's definitely possible that I'm making a deeper connection between cracks and storm damage areas than I should. When you see the bat up close there does seem to be a correlation, but it's true that the experiment may be overtaking the actualite! I can confirm an almost total absence of knocking in. Too noisy, and too much time I'll never get back! The pressing though was made by a batmaker of the highest level. It would not be fair to name him as this is just an experiment, but I'm confident that the cracks are not the result of a lack of skill in that area. I'll keep reporting back with results as things progress. There may be no correlation to the location of the storm damage and the cracks. Two of the three storm damage lines appear to be well in the strike zone. Or 'middle'. So that area will simply have been subject to more hits than elsewhere on the bat. Hence, you'd expect to find more cracks in that area anyway. To be honest i was expecting more comment about the increasing amounts of tape covering the outside edge! Hmm, I still reckon you've got a good chance of that going right clean half in two! Those cracks don't look promising, even with the wood being a bit less dry. You may be right mate, but testing to destruction is all part of the fun! The bat has lost one ounce in weight over the last 6 weeks or so, i guess this moisture reduction could be unhelpful. No stress, I've got another one already made up in the garage. That's the spirit, enjoy the moment if it does go and move on to the next wand. The one time I've had one properly split on me suddenly it was quite amusing watching mid-off trying to avoid half a bat! Page created in 0.96 seconds with 46 queries.